I have been sent to perfect good manners ... Righteousness is good character. Adab is courtesy, respect, appropriateness. Adab is not formality; it helps to create the context in which we develop our humanness. Every situation and relationship has its proper adab: between students on the path, in relation to family members and elders, in relation to one's shaikh. Every level of being also has its adab, including coming into the presence of Truth (Al-Haqq). The model of adab in the Sufi tradition is the Prophet Muhammad (peace and blessing upon him), who said: "None of you will have authentic faith until your hearts are made right, nor will your hearts be made right until your tongues be made right, nor will your tongues be made right until your actions be made right."
. To be Straightforward with sincerity and truthfulness.
. To be aware of and have regret for our own faults, rather than finding fault with others.
. To be free from the preoccupation, worry, vanity and ambition over the world and the worldly.
. To be indifferent to the praise or blame of the general public.
. To do what one does for God's sake-not for the desire for reward or the fear of punishment.
. To adopt an appropriate humility and invisibility in public and in the meetings of the dervishes.
. To serve the good of one's brothers and sisters with all one's physical and other resources.
. To seek to heal any wound you may have caused to another, and to correct any misunderstanding within three days if possible.
. To know that no good will come out of the expression of anger or excessive hilarity.
. To be patient with difficulties.
. To be indifferent to favor or benefit for oneself, for "receiving one's due."
. To be free of spiritual envy and ambition, including the desires to lead or teach.
. To be willing to struggle with one's ego as much as it prevents one from following proper adab, and to realize that the greatest ally is Love. 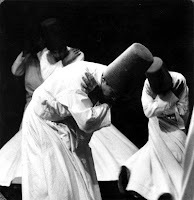 Also read a beautiful summary of some of the qualities that exemplify the etiquette and ethics from the book, Discourses on the Sufi Path, Dr. Javad Nurbakhsh, Master of the Nimatullahi Sufi via Darvish Blog.